Below are some of the most popular fixed camera solutions. 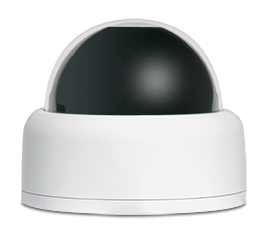 AD Discover Series Mini-Domes The American Dynamics Discover minidome is a vandal resistant minidome at a non-vandal price. The 540TVL resolution bring the sharp color picture to life. Order in either a 3.5-8mm, or a 2.6-6mm Auto Iris lens for the correct field of view for your shot! Weater resistant to -22F, this camera is perfect for the hot summers and cold winters seen around the country. Options include either a white or black base, and smoke or clear bubble (cover). Drone – Ultra Fixed Camera The Ultra Drone fixed camera from American Dynamics has the exact same look as the ultra popular Ultra -series PTZ domes. Able to fit the Ultra dome base and mount, the Drone allows the user to "move" the less expensive fixed camera into positions, switching out the famous PTZ’s around the location in minutes….greatly expanding coverage for far less than traditional methods. And it can all be done without a ladder or lift!